Tinytag View 2 logger, another addition to the successful Tinytag range of temperature and humidity data loggers. Tinytag View 2 loggers have displays for 'on the spot' checking, as well as a large memory for storing data that can be downloaded to the Tinytag Explorer software for later reference. 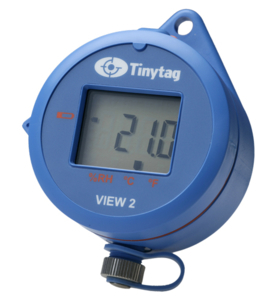 Thanks to its versatility, Tinytag View 2 can be used in warehouses, cold rooms and chillers. They are rugged and splash-proof (IP65), with a large memory size and wide range of sensors. Units with a built-in sensor are ideal for chilled rooms whilst units with external probes can be used for monitoring fridges and freezers. With the probe on the inside of the fridge, and the logger on the outside, there is no need to open the door to log temperature, reducing any impact on stored products. Reading capacity is increased on the Tinytag View 2 from 16,000 to 32,000 readings, enabling longer logger deployment or faster logging intervals. The overall improved accuracy gives a much smoother graph readout from the Tinytag Explorer software. In addition, more robust firmware monitors battery condition and provides improved data integrity.